The doorway under water came to me in a dream back in 1976. There was no mistaking the meaning of the vision. It was a dream about ego-death, hitting bottom, and afterwards, being given entry to the inner world. 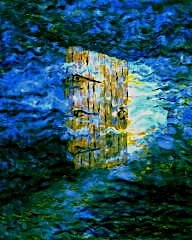 The door was under water, and opened into more water. I later interpreted more sea to mean more see. I did not go through the doorway in the dream. That was a task left to waking life. The dream of ego-death and hitting bottom mirrored the facts of my life at the time. That I stood on the threshold in the dream, and did not go through the doorway, was also significant. It marked the next stage of my journey. The threshold of opportunity. My dream-self, or higher-self, giving me the message that there was a way out. A way through. A way. If I had the courage to enter this deeper see. Because the way out was through. It will always be so. There are never any shortcuts in the non-physical realms. 1976 was a long time ago. I lived in another country then, both physically and mentally. But the message was to go home. Home to myself. My true being. And come to terms with my inner truth. This is a journey we are all bound to take in one form or another. A journey that requires us to step back a moment from the dazzling aspects of the outer world. And look within for answers, guidance and direction. This entry was posted in Art of the Path and tagged alternate reality, Art, art and ascension, autobiography, bridging worlds, creativity, Dweller on the Threshold, expression, Nancy Wait, soul memories, the nancy who drew, truth, Willingness to Change. Bookmark the permalink.